Spend 2-nights in a first class hotel in Rome to explore the city. 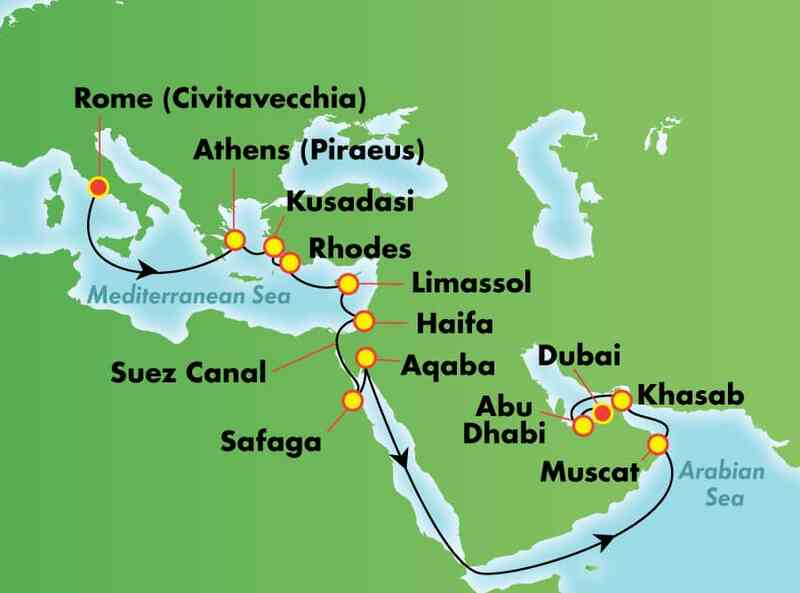 It is followed by a 22-day voyage to the breathtaking wonders in Greece, Israel, Egypt, Jordan, Oman and UAE. Immerse yourself in Athens’ past and present by scaling the Acropolis or Parthenon before taking a stop at one of the family tavernas on the cobblestone streets of Plaka. Then it’s off to explore the Cyprian city of Limassol. Take a walk along the seafront promenade. See medieval art at the Limassol Castle or learn Cypriot history at the Folk Art Museum. In Haifa, visit the extraordinary Baha’i Shrine and Gardens. Then climb in a cable car for breathtaking views on your way up to the Stella Maris Monastery. The port city of Safaga is the perfect place to park yourself beachside or partake in some parasailing. Once you’re in Abu Dhabi, make sure to bask in the majesty of Sheikh Zayed Mosque before exploring the cavernous Marina Mall. 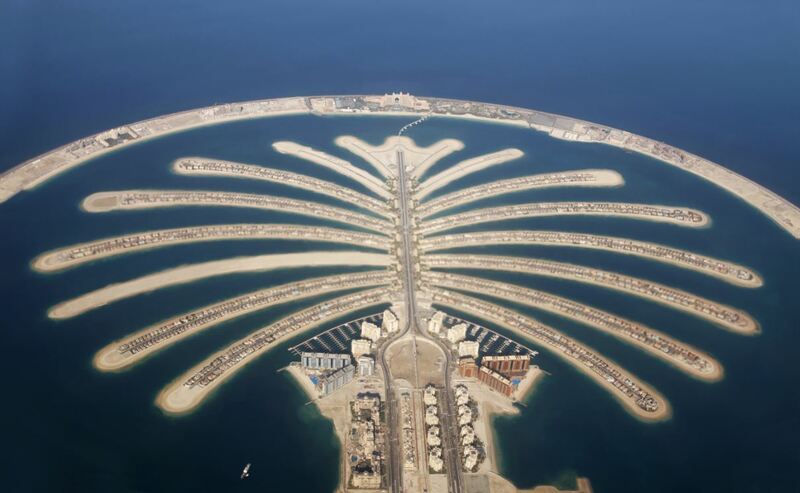 Conclude your Arabian adventure in Dubai with a 2-nights hotel stay and local sightseeing. Meet your fellow travelers at the departure gate in Toronto airport for your flight to Rome, Italy. Take a journey into the past in richly historic Ephesus. Once an ancient Greek city, Kusadasi was known for the famed Temple of Artemis, one of the Seven Wonders of the Ancient World. Built, destroyed, and rebuilt again through several notably historical periods, Ephesus boasts abounding ruins and archaeological excavation sites. View what remains of the Roman Library of Celsus, the Gate of Augustus, the Tomb of John the Apostle, and the Basilica of St. John, among several other ancient remnants. This Greek Island just off the coast of Turkey exudes beauty and history. Take a walking tour of the old fortified city and stand in awe of the impressive Grand Master’s Palace. See where the Colossus of Rhodes, a onetime Wonder of the World, once stood and savour the charm of this remarkable walled town. Along the scenic coast lies the whitewashed town of Lindos with its ancient acropolis and stunning views. Considered one of the Middle East’s most picturesque cities, Haifa offers incredible sights everywhere you turn. It is also close to holy sites – travel to Galilee, Nazareth or Jerusalem. The views from Bahai Gardens on Mount Carmel, the largest hanging gardens in the world, are incredible, and make for a superb picture spot. Peruse the boutiques on Massada Street or go to the artists’ village of Ein Hod for hand-blown glass and crafts. Connecting Europe and Asia, this canal through the desert challenged engineers for nearly 4,000 years. Egypt’s pharaohs attempted to connect the Nile River and Red Sea but gave up, as did Napoleon Bonaparte thousands of years later. Begun in 1858, the 120-mile (193 km.) Suez Canal took 11 years to build. Unlike many other canals in the world, the Suez Canal has no locks because the terrain is so flat. The passage from one sea to the other takes only 11 to 16 hours. Set on the Red Sea, Safaga is a watersports playground. Kite surfing and windsurfing rule here, but diving is also a top attraction with nearby reefs and wrecks. If sun worship is what you seek, the desert sun and black-sand beach will fast-track your sun tan. Experience the splendour of ancient Egypt on an excursion to Luxor, the Karnak Temple Complex and the 3,400-year-old Colossi of Memnon statues. Aqaba’s history dates back to 4,000 BC and was once a key Roman port. With year-round sun, you can enjoy watersports and explore the coral reefs of the Red Sea that teem with brightly coloured fishes. Magnificent Petra, an ancient city carved out of stone, and one of the World’s Seven Wonders, is nearby. Back in Aqaba, visit the 13th-century castle fortress, archaeological museum and mosque and enjoy a traditional lamb dish with yogurt and rice accompanied by mint tea or sweet Turkish coffee. View Muscat from above by travelling on the Corniche and head out along the scenic Batinah coast. The medieval Nakhl Fort, perched on a rocky outcrop, offers magnificent views of the mountains and oasis below. The colourful Sultan’s palace and the Jelali and Merani forts are worth visiting, and if you seek to experience Omani culture, a stroll through the markets and narrow alleys is ideal. Exquisite local silver jewelry, exotic spices and handicrafts abound in the markets to tempt shoppers. Located on the tip of Oman’s Musandam peninsula, an enclave separated from the rest of the country, Khusab has been described as the “Norway of Arabia.” Its many beautiful fjord-like inlets and stark landscapes created by geologic shifting are striking, and the clear, calm waters are home to dolphins, which can often be spotted interacting with boats. This quiet enclave is also home to Khasab Castle, a small fort where you can learn about the history of the area and local traditions. The world’s richest city boasts a wealth of culture, history and adventure, from the emirate’s old souks, where you can sip a fragrant Arabic coffee, to the rush of the world’s fastest rollercoaster. This 5,000-year-old metropolis is a fascinating mix of modern architecture and atmospheric back streets. Put your bargaining hat on for a friendly faceoff with the merchants at the souk to get deals on handicrafts, artwork, even spices and dried fruit for the cook back home. BALCONY – Cat. BA $10,795 All above fares are subject to change without notice. Initial deposit of $1000 per person. Final payment is due by: OCTOBER 2, 2019. 1 Lunch and 2 dinners while in Dubai. 2 Nights first class hotel stay in Rome. 22 Day cruise aboard Norwegian SPIRIT. 2 Nights first class hotel stay in Dubai. Local sightseeing while in Rome and Dubai. All departure port taxes/fees and surcharges.